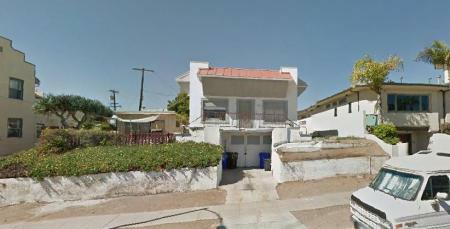 Up for demolition is this building at 4941 Del Mar Ave.
UPDATE: MEETING CANCELLED – due to applicant withdrawing project, and lack of update on crosswalk. 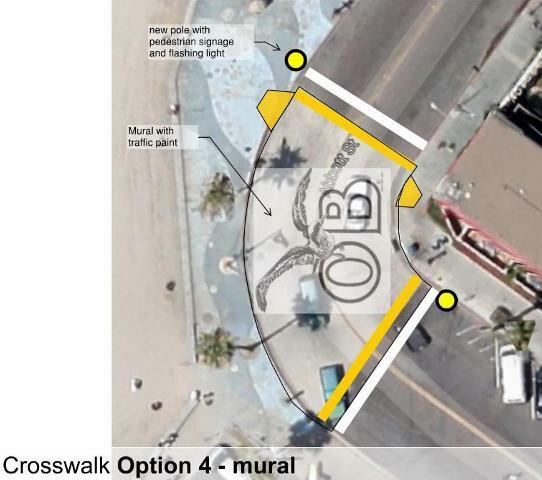 The Project Review Committee meets this Wednesday, November 19th, and up for their consideration is a Coastal Development Permit to for a demolition and construction project on the 4900 block of Del Mar Avenue and the crosswalk, and the crosswalk being considered at Newport Ave and Abbott Street. As a sub-committee of the OB Planning Board, the Project Review Committee, chaired by John Ambert, gets to review projects before they are considered by the full Board, and then usually makes recommendations to the Board on whether to approve them or not. 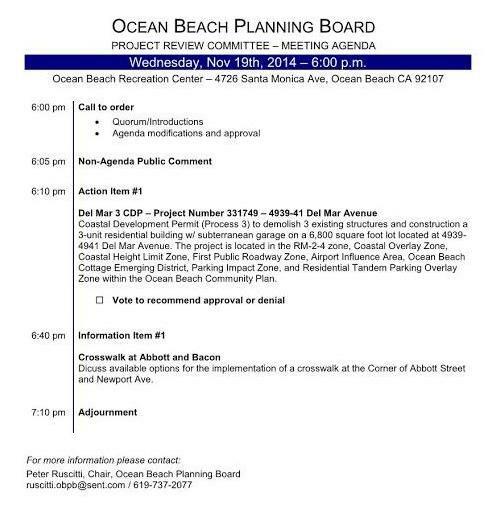 The sub-committee meets at 6pm sharp at the OB Recreation Center, 4726 Santa Monica Avenue. 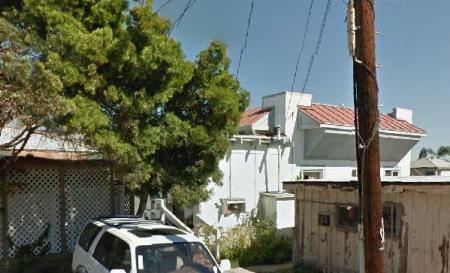 View from Ocean Front Street, more of an alley than a street. 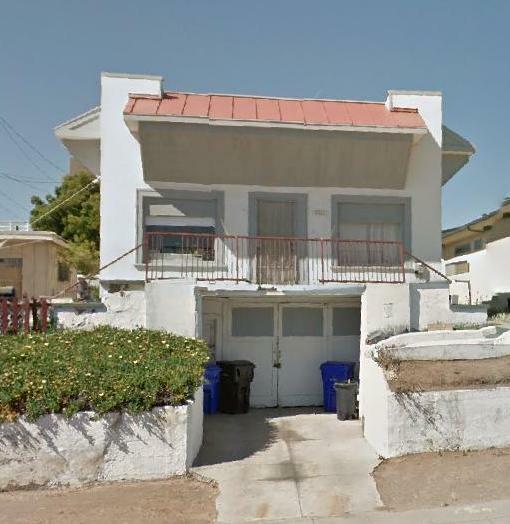 The demolition and construction project on the group’s agenda is a Coastal Development Permit to demolish three existing structures and then construct a 3-unit residential building at 4939 – 4941 Del Mar Avenue. The new building would have a subterranean garage. 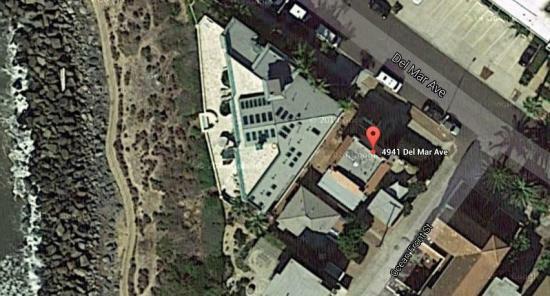 The site is a 6,800 square foot lot, very near the intersection with Ocean Front Street, less than a block from the beautiful Sunset Cliffs. Also on the agenda is a discussion of options for the crosswalk being considered at Newport Avenue and Abbott Street. See this visual analysis of some options. What a shame that that sweet little house didn’t get sold to an owner who would renovate it and keep its footprint in that block. Instead, the plan for a 3-unit residential building will just increase the number of apartments in that block, and diminish to getting-towards-zero the single homes. Isn’t the current place already a 3 unit property? If so, then there is number of apartments on that block will remain the same and that shack in the corner of the lot will be gone, and that is a good thing. Tim I totally agree. I’ve always loved this place, it would be sad to see it torn down. I noticed recently the beams were covered up. They really showed off the character of the building… I wonder if it’s a ploy. Any body know when this place was built? When YOU buy land YOU decide what to build, until then don’t get in the way of progress. This parcel has very good potential. Any change would be better than what is there now. BUILD IT, BUILD IT BIG, BUILD IT NOW ! Just to remind you, property owners do not have carte blanche in what they can build in OB (or anywhere for that matter). There’s the recently approved OB Community Plan Update; there’s the historic 30 foot height limit, the .7 Floor Area Ratio, there are set-back limits, parking requirements,, Coastal Commission rules, and so forth. The reasons we have these restrictions on over-development is because the coast, OB and Southern Calif in general got hammered by unbridled construction during the 50’s, Sixties and 1970s, by property owners who got to decide what to build without any community input, and OB suffered from what you called “progress”.